The location is amazing; the hotel is located next to the water and the passenger ferry at the mouth of the fjord. We liked the unique room with the hide on the bed and the skylights. We could lie in bed and see the waterfalls. You can't beat that! We liked the breakfast and views. We were concerned about feeling isolated in Gudvangen however we absolutely loved the serenity. Accommodations: Excellent! Loved the skylight views of the nearby waterfalls. Spacious rooms. En suite bathroom. This is a good place to end the fjord tour. Once the last tour bus leaves, you feel you have this special place all to yourself. Loved lying in bed watching waterfalls thru the skylight. Very sweet and friendly staff. Wanted to stay another night just to relax from a very busy 3 week tour schedule. The location cannot be beat! All I wanted was to spend some time looking at the Nærøyfjord and walking along it, and the location was perfect for that (there is a path to Bakka along the fjord). The dining area of the hotel is all glass, so you can enjoy the views of the fjord and waterfalls at every meal and in between. 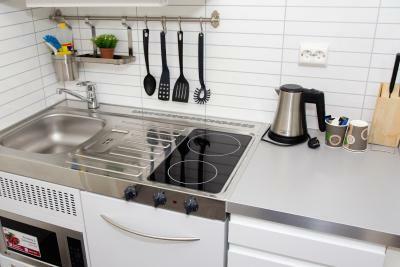 In the two-beds apartment, the floor was heated, the water was warm, and the cabin was extremely clean and comfortable. I could sit on the porch and look at waterfalls. Exceeded expectations, was there at the end of the season so got a free upgrade which was lovely. The location is incredible and it was very clean. The proximity of the kayak rental is great, and the layout of the buildings works very well. 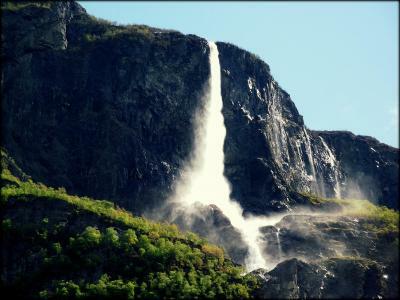 The location was really good as the property is right beside the fjiord which has amazing views. Views from the room are absolutely spectacular. 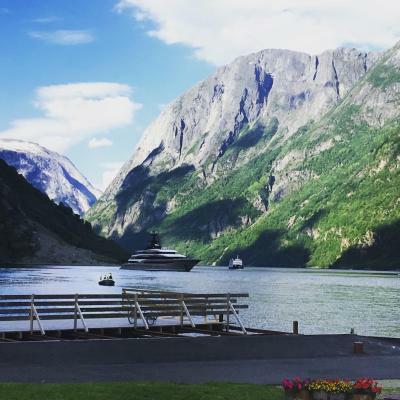 Absolutely an amazing place to spend some time in the fjords. Much nicer than the neighboring town of Flåm as there are fewer people, however there was easy access to Flåm by bus, car, or ferry. The host is super helpful. I was late check in due to traffic but the host willing to stay up till midnight make sure we can get our key for the apartment. Location is perfect. Walking distance to the fjord. The view in Gudvangen is perfect! Gudvangen Fjordtell & Apartments This rating is a reflection of how the property compares to the industry standard when it comes to price, facilities and services available. It's based on a self-evaluation by the property. Use this rating to help choose your stay! Located in western Norway’s Nærøyfjord, a UNESCO World Heritage Site, this waterfront hotel offers easy access to ferry boat fjord tours. 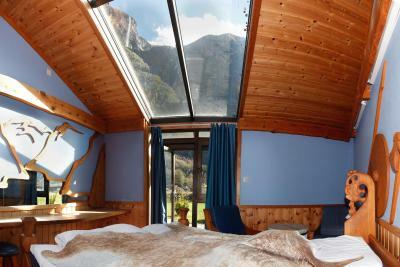 Some rooms have skylights with views up to Kjelsfossen Waterfall. Gudvangen Fjordtell & Apartments guests can choose between a hotel room or apartment accommodations with kitchen facilities. All feature a work desk and some offer Viking-themed rooms. 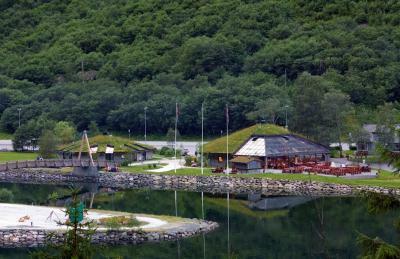 Guests dining in Gudvangen Fjordtell’s on-site restaurant can enjoy fjord views from huge glass windows. The menu has Norwegian cuisine based on organic, locally sourced ingredients. The large terrace can also be enjoyed during warm weather. Staff can recommend area activities, such as fishing and hiking. Ferry tours through the fjord begin within a minute's walk of the property. 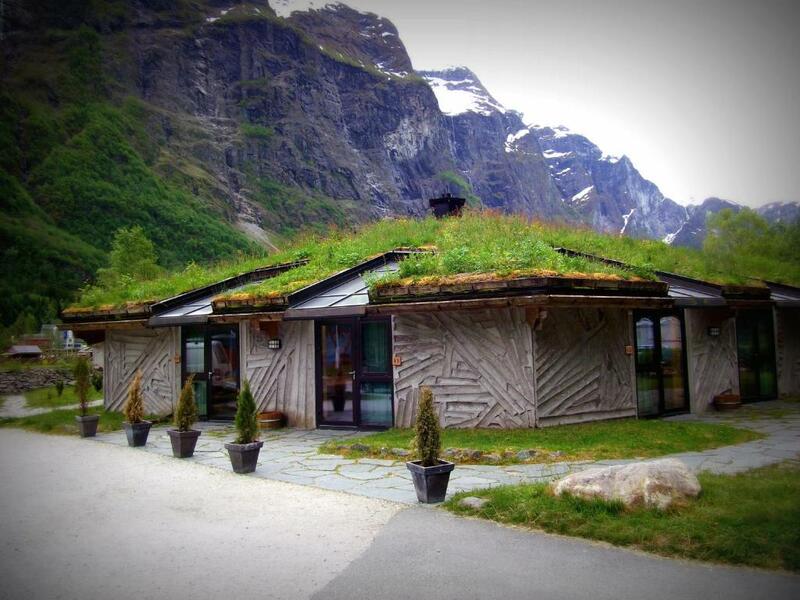 When would you like to stay at Gudvangen Fjordtell & Apartments? Viking-themed room with a large bed and skylight ceiling windows to view the scenery overhead. This apartment includes a work desk, private kitchen and a bathroom with shower and free toiletries. Features light wood furnishings, a desk and views of the river leading out to the Nærøyfjord. A family-run hotel located in western Norway’s Nærøyfjord, a UNESCO World Heritage Site. The hotel is designed in a Viking style from approximately 1000 ad and manufactured by local craftsmen, with inspiration from old Viking findings. The hotel offers Viking styled rooms, some of it has skylights with views up to Kjelsfossen Waterfall, where guests can enjoy the unique experience of Viking age, also standard rooms with kitchen and terrace, apartments. The hotel has also restaurant, offering Norwegian cuisine based on organic, locally sourced ingredients, bar, lobby, restaurant terrace with panoramic view of Norway's most breathtaking, UNESCO-protected fjord ( Nærøyfjord ) surrounded by high mountains. 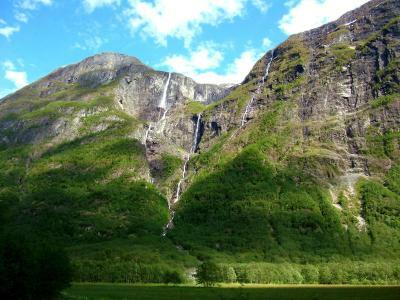 The place has everything travelers expect in a holiday - nature at its most spectacular, along with excellent opportunities for boat trips, kayaking,fishing, hiking, photography… Experience the world's most incredible Nærøyfjord, surrounded by steep mountains, thundering waterfalls cascading down their sides and narrow valleys. 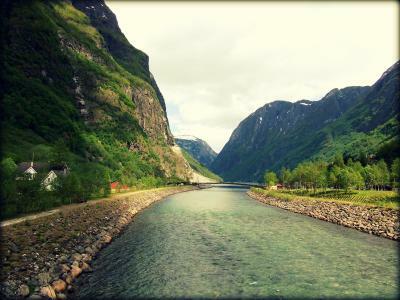 It is the starting point (just 50 m from the hotel) for ferries that provide fjord tours. We offer free WiFi and free private parking. House Rules Gudvangen Fjordtell & Apartments takes special requests – add in the next step! Gudvangen Fjordtell &amp; Apartments accepts these cards and reserves the right to temporarily hold an amount prior to arrival. Gudvangen Fjordtell & Apartments accepts these cards and reserves the right to temporarily hold an amount prior to arrival. Please inform Gudvangen Fjordtell & Apartments of your expected arrival time in advance. You can use the Special Requests box when booking, or contact the property directly using the contact details in your confirmation. Very comfortable, clean and a great location!!! Wonderful views! Since we were the only guests it would have been nice to have the Viking rooms facing a little more to the water than facing the the road, but it was still fabulous. 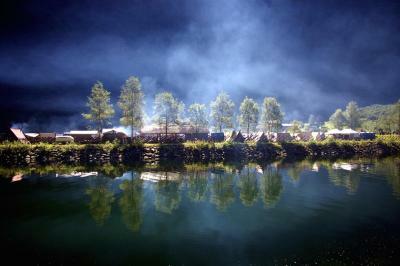 The uniqueness of the Viking themed rooms, the staff, Gudvangen as a whole and the Viking village. The breakfast was basic in comparison with the other hotels across Norway in the same price range. Unfortunately there is no other option nearby but to eat in their restaurant. Great location at start of fjord. Comfortable room with skylight to mountains all around. The location was phenomenal. Very cool room decor. very very nice…staff is enthusiastic and upgrade us Viking room…so good experience.i will come again. Staff were very helpful and friendly. Check in and out was great. Even opened up the shop in the evening for me. Our Viking room was very good and skylight would have been superb for sky gazing if it hadn't been cloudy. The bed was lovely and the room looked fresh. Breakfast was basic but cooked to order and tasted great. Dinner was more basic and no other choice locally when off season. Very close to boat and bus stops. Would come and stay again. Dinner: Soup was generic; tasted like it was chili from a can, and staff said it was not local. Trout was bland. Dishes did not feel authentic. Breakfast: Staff offered us only eggs and bacon when we were excited for a traditional Norwegian breakfast buffet (which is what was advertised, and what we pre-paid for). After some coaxing, they brought out a real Norwegian breakfast, which took moments (clearly it had already been prepared!) and it was delicious. I gave it a 10, what else can I say? An interesting building in a beautiful location.